Wilkhahn’s Aline range, designed by Andreas Störiko, sets a new standard for furniture in variable meeting rooms and informal communication areas. Aline is a multi-purpose furniture range, with a design that combines the function, strength and aesthetics. Seat and backrest frame of the chair is molded in reinforced plastic with a transparent and strong net on seating surfaces. The net is both climatically, comfortable and easy to maintain. A chrome-plated skid-base ensures the stability. The result is a piece of furniture with exceptional user properties and well-chosen materials which combine maximum strength with minimum weight. 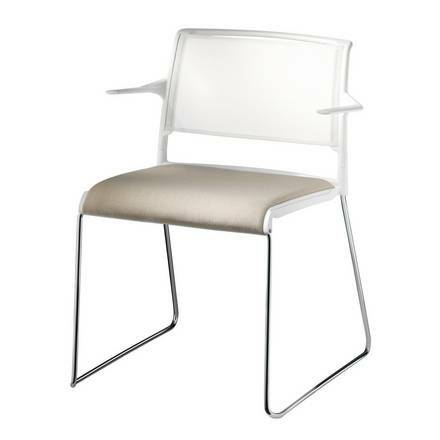 Seat and back frame and net of the chair are available in black, gray or white. A small masterpiece: Quick and easy handling are important features for multi-functional furniture. Aline's lightness and strength are making life easier: A handle in the backrest provides a good grip when the chair are being moved or stacked. An integrated guiding groove in the seat frame allows the chair to slide horizontally when stacking which prevent unnecessary lifting. As an option the chair comes with a built-in inline connector - spring loaded for secure and fast linking in rows. Aline is ideal for restaurants, conference areas, auditoriums, waiting rooms, canteens or at domestic interiors. The high chairs complement the Aline stacking chair with the same design elements and the stability, provided by the chromed skid-base. This makes it possible to plan in both types of chairs in the same interior. 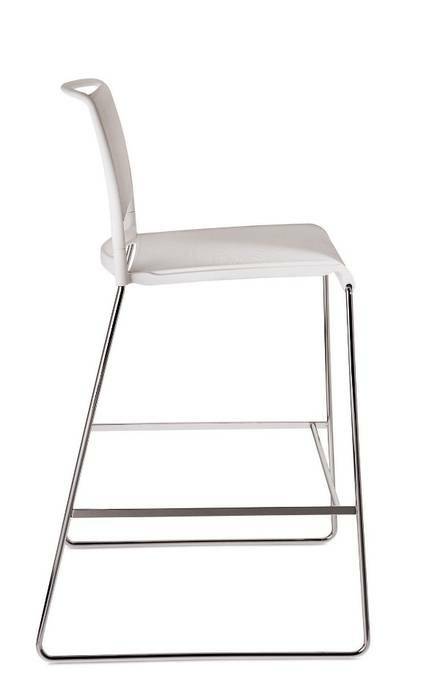 With a seat height of 69 cm (versus normal seat height 44 cm), the high chair can be used as a bar stool, at touch-down tables and at counters where table top height is approximately 100 cm. The high chair is available with or without integrated armrests and comes in 3 colours: black, gray and white fiberglass reinforced frame with net seat and backrest in matching color. The net in the seat can be replaced by a fabric upholstery. All high chairs come with a footrest.